A Beetle In The Network (Durito version freeware). So, please be kind and patient and accompany us in this gaze from here below to there above. Oh, the desperation of communicologists, political scientists, columnists, and news directors: they no longer mark or signal the topics of the day, nor impose their own analysis—which was not infrequently lubricated by bills of all colors. Now everyone has their own way [of getting/ spreading news], their own calendar and geography. Let’s leave aside for the moment that pathetic relationship between media personalities and political personalities on all levels—royalty, ministry, presidents, governors, legislators—whose “transcendence” is only of interest to frivolous journalism (that is, all the paid media). The reflections of political commentators and journalists on this issue only of interest to those increasingly scarce “professional commentators” for their own columns. As it turns out, the people (that rebellious mass that doesn’t look where it is ordered to look, nor listen to what it is ordered to listen to), have acquired the particular mania of making daily life front page news: how one styles one’s hair, what happened to me in this particular place, what I like or don’t like, what I saw/ heard/ said and what was said to me, the crimes that don’t appear in the paid media, the ridiculous reiterations of governors (previously hidden by piles of money in the paid media’s closets) that are now exposed without their control. What’s that? That the supposed champion of liberty and democracy – the North American government – spies with impunity, or commits barbarities all over the planet? Boom! The web becomes the irreverent hand that tears down the set design that is hiding Power’s great obsession: to control everything and everyone, to know everything. And suddenly, when Power realizes that it wasn’t worth it to pay off their principal spotlights (the media) to either go dim or point toward the spectacle of idiocy currently in fashion, the self-respecting, the people, the plebes, the gang, turns on their own little lights, not to rhythmically accompany the ballad played above, but to show that the king/prince/ minister/ president/ governor/legislator has no clothes. Realizing that it is exposed, Power only manages to blabber incoherently and, of course, criminalize those who have exposed it. What happens when this or that politician or official pathetically acts out his/her syndrome of “you-don’t-know-who-you’re-messing-with?” Boom, cybernetic slap upside the head and everyone has heard/seen/and spread what he/she did. And the legal and police response? The arrest of the twitterers of course, a legislative initiative to control the social networks, global airspace usurped by the North American government, the pathetic servitude of the European governments (“he’s just an Indian, detain him”). In sum: internet=(the same as) the immediate and massive globalization of the ridiculousness and incapacity of the political class. But watch out! Because there above they have also realized that the instantaneous (as massive evidence of their incompetence) is also fleeting. And that the remedy for a scandal is a bigger scandal. That the best antidote for one viral “hashtag” is another. As long as those denunciations don’t move from “we have to do something,” to “we have to do this,” and from there to a calendar and geography (“we have to do this in this place on this day”), then there is no problem. Power doesn’t have any problem with its absurdities being dinner table topics, but it does, for example, have a problem when the new “international terrorists,” that is, the social networks, move from ridicule to mobilization… then the “red telephones” begin to ring (okay I know they don’t actually use those, but you know what I mean) in the centers of Global Power—that is, in the financial centers. Because it’s one thing to get individually enraged at injustice; it is something very different to make a collective of the Enraged. In sum, problems become serious when the little hands in the network become defiant fists in the street… and in the countryside. But there up above, the analysts insist on the cursed and doubly cursed “conjuncture” (that’s the “historical context” my dear). And it’s always the same spectacle. For example, the elections… Pre-electoral, electoral, and post-electoral fraud. The conclusion is almost unanimous: “they don’t work”… until the next electoral season and the next fashionable visionary offers the same as always: that yearned for freedom within reach of a vote. And just like that, salvation is found in making an “x” in a certain spot on a little piece of paper, fervently depositing it in a box, and waiting for that intangible being called “the majority” to appear as an ironic disguise for those who really make the decisions: a handful of people with money. “The Society of Power,” we the Zapatistas call it, maybe only to point out that Power and its criminal practice do not reside in the traditional apparatus exalted by political science and politicians. 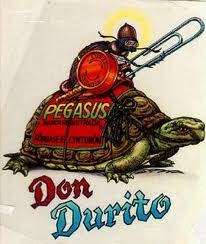 Don Durito of The Lacandón E.K. of V.M. of (u)L. (i)R.
Little Leaf of Huapác # 69. Errant Knight and Cybernetic Graffiti Artist. At sign plus (triple) w dot #yosoy69yomiyomi. Free download only for linux. Say yes to free software. I did not of course ask him what all of that meant. So, Durito tells me, what better moment to make his reappearance than when a small, tiny really, number of people, from widely dispersed geographies and calendars, are awaiting the beginning of classes in the Zapatista Little School? For those who don’t know him or don’t remember him, (or for those who, like the author of this text, have tried to forget him), Durito is a beetle. True, not just any beetle. He calls himself an errant knight (and tends to recite entire paragraphs of “The Ingenious Hidalgo Don Quijote de La Mancha”). He carries a badly straightened out paper clip as a lance, a piece of cacaté shell as a helmet, an old cap from a medicine bottle as a shield, and as a sword that, well that will take a little more explaining, because his sword is nothing other than “Excalibur” (although it looks an awful lot like a little twig). To top it off, his mount is not a horse, but a little turtle the size of your thumb, which he calls “Pegasus,” (“because he seems like he’s flying when he really picks up speed,” Durito explains). In order to understand the contemporary functioning of politics above, one must attend to its new cultural center: the paid communications media. Attention to this point: note that I didn’t use the traditional “mass communications media,” because there are alternative media (or free media or whatever you call them) that are massive and other media that are terrains of struggle (like the Internet). Take television for example. Turn on your TV and you will see how reality imitates publicity. There are those commercials about marvelous devices that not only allow you to lose weight but also give you an appetizing figure. If you get one of these devices, you can stuff yourself with garnachas, baked goods, carbohydrates, hydrocarbons, sugar, and sodium benzoate in generous portions, and on top of that you can throw yourself on the couch or bed or hammock or floor (there are still social classes) and play video games, read a novel, or watch a television series. In just a few days, you will have a figure like the young man or woman that at this very moment is on TV demonstrating how easy the device is to use, and how it also happens to be useful for hanging your clothes on to dry. Okay, so that is how politics above work when they ask for your vote. It’s not necessary to organize, or to struggle every day everywhere to construct your own destiny. For that, all you need is this product [candidate]. And in this new version, we have included a reset button, and in addition, it now comes with a little bottle of floral-perfumed hair gel. It will take care of everything. You just sit there comfortably and you will see how the offers of dignified work and low-interest loans abound, as well as secular and scientific schools free of cost, culture available and accessible to everyone, housing complete with functioning, low-cost amenities, nourishing food, well-equipped hospitals and trained medical personnel, prisons full of real delinquents (that is, bankers, public officials, and police), land for those who work it and natural resource wealth as national property. In sum, the world you have always dreamed of, but without having to do anything but check a little box on your ballot. Nope, you don’t even have to bother to watch that they don’t cheat or don’t count the votes properly, we’ll do it for you! Ah, the freedom “bioshacker”: lose weight without moving (let the device move for you); be free without struggling (let the leader struggle for you). Now, don’t turn off your television. Let’s see what’s behind those commercials. No, those muscular young men and those lush young women don’t use these devices. If you ask them offstage they will tell you that they’re useless, that they would never buy one, that one only achieves a good figure through healthy eating and exercise. You follow me? Well, it’s the same thing in politics: those who really rule in the world don’t believe in electoral democracy, they know perfectly well that nothing fundamental is decided there. They know that the true ruler, Power, is somewhere else, with them. a) You listen to the man/woman/young lady and decide you should try it, that maybe now for real, what we have to do is try a different political party… with the same politicians as always. b) You change the channel or push play on the DVD and start a conversation with your partner or your dog or your cat, or all three, about why the zombies always lose despite being the overwhelming majority. c) You don’t have a television or you turn it off, and you look online to see if anyone has rented a bus to go to San Cristóbal de las Casas, Chiapas, from August 8th through the 18th, in order to go the [anniversary of the Good Government Councils] party, to the Little School, and to the Seminar of the Native Peoples. While you turn on your computer, you try on those horrible boots that somebody told you would be good for when you went to Chiapas. d) You didn’t read/understand the question. If you chose option a, don’t even come, you’re just going to get mad. If you chose b, don’t worry, we look like zombies too… although, a little hair-styling wouldn’t hurt you. If your choice was c, you should know that those boots are not going to do you much good. If you chose d, start over at the beginning of the text (no, not this one, the one that was begun over 500 years ago). Tan-tan. End of Durito’s preparatory course. Perhaps you will find answers to these questions in the course “Freedom According to the Zapatistas.” I can’t guarantee it though. What you can be sure of is that, even if the answers are few, the questions will abound. (Ah, Durito also brought a story, “the history of the cat-dog,” but I’ll leave that for another day). Vale. Cheers and believe me, anything worth doing can’t be easy, for example, climbing that hill so that you can see how the light slowly hides under the shadow of the dead of night. Written by León Gieco and performed by Carlos Karel, the track, “Señor Durito”. From the popular series, “Hitler finds out,” here his response to the electoral campaigns in Mexico and the new candidates, like Morris the Cat (note: contains strong words that may be offensive, but nothing you don’t hear on a daily basis in any part of the world).